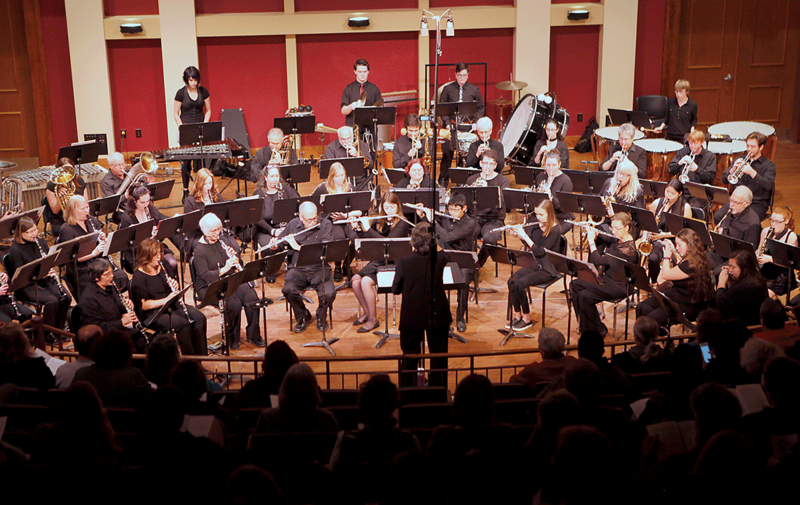 CANTON -- St. Lawrence University’s Wind Ensemble will perform their spring concert, “Winds of Time,” at 8 p.m. on Tuesday, April 16, in Peterson-Kermani Performance Hall located in the Griffiths Arts Center. The event is free and open to the public. The Wind Ensemble, under the direction of Theresa Witmer, will perform classic and new music from the wind band repertoire. This 47-member ensemble is comprised of 23 St. Lawrence University students, five faculty and staff, and 19 community members. The program starts with “Ammerland” by Jacob de Haan, a beautiful piece that takes the listener to the north of Germany and a countryside decorated with fields of wildflowers and windmills. “Rhythm of the Winds” by Frank Erickson is classic literature for the group and combines bright melodies with lush harmonic writing. Subtitled “In Memoriam, September 11, 2001,” noted composer Eric Ewazen’s “A Hymn for the Lost and the Living” is a powerful and dramatic work. The next piece explores the notion of time and was inspired by a 1960 short science fiction story by J.G. Ballard titled “Chronopolis” using eight percussionists to add chimes and clock sounds in a skillful and entertaining way. “Pilatus: Mountain of Dragons” depicts the Pilatus mountain peaks near Lake Lucerne, Switzerland. Composer Steven Reineke, in this commission for the Youth Wind Orchestra of Lucerne, draws on ancient legends of Pilatus’ dragons and has created an exhilarating tone poem. Staying with the dragon subject, the Celtic-inspired music from the movie How to Train Your Dragon is next. The music for the movie was written by John Powell and has been arranged by Sean O’Loughlin. The Wind Ensemble will close the program with a powerful classic piece from the band repertoire, “Symphonic Dance #3: Fiesta” by Clifton Williams. Complete with trumpet fanfares and hints of bull fights, street bands, and pageantry, Williams composed this work to honor the Latin-American traditions of San Antonio, Texas. For more information, call 315-229-5166 or visit www.stlawu.edu/music.